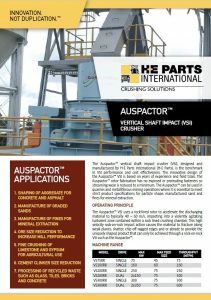 H-E Parts manufacture and supply the Auspactor™ Range of VSI crushers to global markets. The innovative design of the Auspactor™ VSI is based on years of experience and field trials. It provides easier and fewer tip and part changes resulting in lower running costs. With the unique design and flexibility of the Auspactor™ rotor, many VSI owners have retrofitted the Auspactor™ rotor to reduce maintenance costs and improve shape and productivity. The unique Auspactor™ rotor fabrication has no exposed or protruding fasteners so streaming wear is reduced to a minimum. The Auspactor™ VSI uses a rock-lined rotor to accelerate the discharging material to typically 40 – 60 m/s. The high energy material leaving the rotor impacts into a turbulent wall of stone in the crushing chamber. This high velocity rock-on-rock impact action causes the material to fracture along weak planes, shatter, chip off ragged edges and or abrade to provide the uniquely shaped product that can only be achieved through a rock-on-rock VSI.